If you have never heard my story of how my heart for volunteerism developed, I would love to share it with you sometime, maybe even over a cup of coffee; it’s one of my favorite stories to tell, and we all know how I love to talk. But the point of this story is that I’ve been given the opportunity to do something that has been on my list of aspirations for years. I have wanted to be an official part of a nonprofit organization, like on the board, not just an occasional volunteer; and I am a strong believer that when God placed a desire in our hearts, He will open the doors to fulfill the desires we just need to be willing to step forward to do our part. Now, let me briefly rewind, while trying to keep it brief. 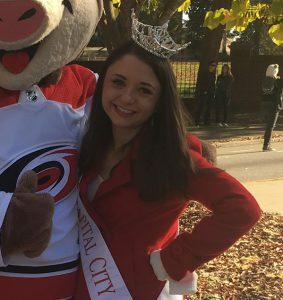 I volunteered with 16 nonprofit organizations while I was Miss Capital City 2017, and I set all of those up on my own. So I’ve handled communication to volunteer and then done the volunteerism aspect the day of the event. I have never been involved in the minutia of the planning of a nonprofit event. But at the risk of tooting my own horn. Teaching and Miss America have prepared me. and I am LOVING EVERY SECOND. We’ve had one in person meeting. The rest of communication has been over email and phone- but this is coming together and I am stoked. We went and saw the space on Sunday and the visualization I have of this event now is even more real and exciting. I have been able to use my communication and networking skills like never before. And it has helped me grow for the future I hope to have professionally, as well. I have sent more emails than I can count. I am still speechless at the positive responses. I am overwhelmed with the gratitude for every donation. I am also endlessly grateful for the sisters who reached out to include me in this and the fact they’ve let me just run with it. This is where I want to put in a little plug to the sponsors we’ve confirmed: Nothing But Noodles, the Southern Christmas Show, Howl at the Moon, DogTopia, Lucky Dog Bark and Brew, Pure Pizza, Opera Carolina, Tin Roof, The Comedy Zone, Zootastic Park, the Carolina Renaissance Festival, 704 Shop, Blumenthal Arts, CRIV Boutique, Smoothie King, Tin Roof, Bechtler Museum of Modern Art, Montford Misfits, Pizza Peel/Improper Pig/Flying Biscuit, Choplin’s, Hype Fitness, and AR Workshop Belmont. Our in-kind sponsors are: Sunshine Beverages and Domino’s. Our advertising sponsors are: Beasley Media Group and Orange Barrel Media. Tickets go on sale to Bre Fest on September 1st. It’s going to be amazing. You should be there. If you have a business, you should consider being a silent auction donor, monetary donor to the scholarship, or donor for supplies for the day of the event. As a 501(c)(3) any donations are tax-deductible and all sponsors will be promoted leading up to the event and on the day of the event. The scholarship also stays in the Piedmont because it will go to an UNCC student. I am so excited to share this with you guys, and I would love to have you be a part of this special day to honor Bre. *Bre was a Kappa Delta sister at UNCC, who we unexpectedly lost in the fall of 2017. The scholarship was founded in her memory as Kappa Delta honors sisterhood forever and we believe that Bre truly pursued that which is honorable, beautiful, and highest.